Individual Fabric Consultations: January 5 and 20, 2019 (by appointment). Quilt Sizes: Standard, 69 x 69 inches or Queen, 98 x 98 inches. You will need to purchase the pattern for your preferred size directly from Melanie. The Queen size quilt uses a pattern extension which is purchased separately. Description: This stunning classic has a maritime theme, perfect for Northwest Quilters! Mariner’s Compass was Judy Niemeyer’s second “Technique of the Month” pattern, originally published in January, 2013. The pattern is only available through Certified Instructors or shops. 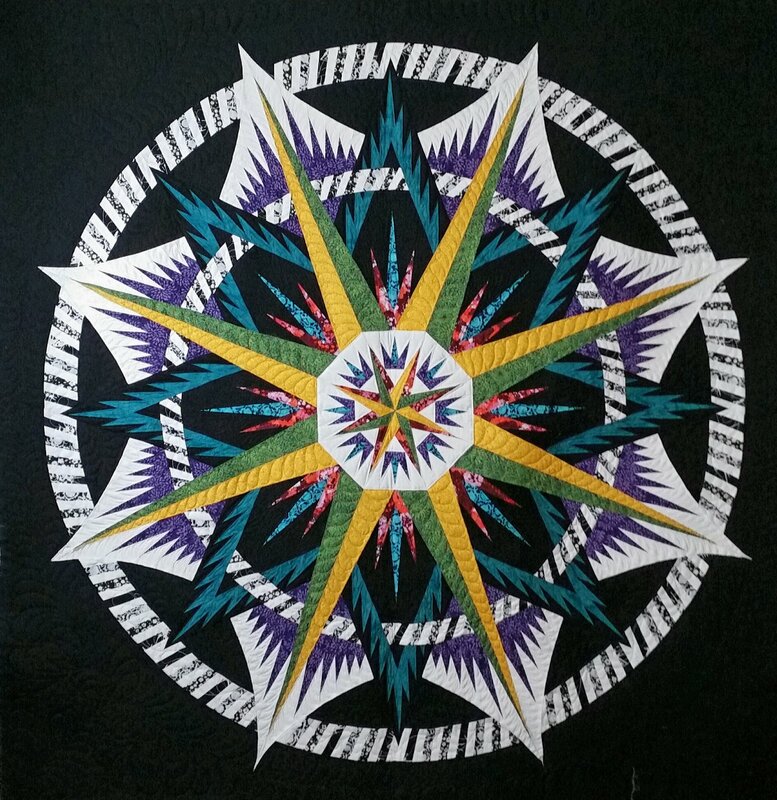 The goal of the Technique of the Month program is to design quilts incorporating a wide range of Judy’s techniques, intended to be taught by Certified Instructors so that they may familiarize quilters with the unique techniques used in Judy Niemeyer patterns. That means, in six monthly class sessions you will learn all the techniques necessary to complete, not only the Mariner’s Compass quilt, but any of Judy’s previous patterns as well. This is an excellent class if you are new to Judy Niemeyer’s patterns and techniques. Though the quilt looks impossibly difficult, you’ll learn to hack it one segment at a time with Melanie’s expert assistance. Required Pattern: This Technique of the Month Pattern is only available from a Certified Instructor. Students will purchase the Mariner’s Compass pattern directly from Melanie. The Pattern is $65 for the 69 x 69 inch quilt. It can be enlarged to 98 x 98 inches with a pattern extension (an additional $30).